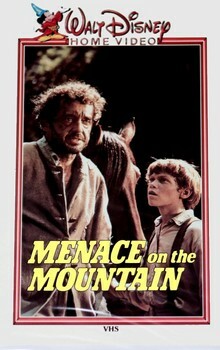 Menace On The Mountain (another two part Disney show from the 1970s taped together into a TV movie) is as toothless as one of the old coots that hung around town cowering before the villainous Poss Timmerlake. The story of an ugly red headed kid (Jed) with big pouty lips who constantly whines about how his pa was last seen gutshot at some Civil War battle and that he wished he was man enough to take on this Poss dude, doesn’t generate much interest beyond the questionable thrill you get from watching Jed chase after his pet pig. With Jed’s dad MIA, the movie details some of Jed’s adventures in being the man of the house. Like having to go to the market to sell his goods and worrying that the price he got isn’t very good. That’s some pretty scintillating action! It’s right up there with the talk of Ma trying to get the taxes paid. Thank God that Poss showed up and brought his bad attitude and that a panther is on the loose in the county. Without those two events, we might have been subjected to talk about rotating crops or the big late night scene where Jed has to balance the family’s checkbook by candlelight. There may be a bounty of $35 out on the panther, but there needs to be bounty on this movie for some frontier-style action! The whole panther storyline though is played out pretty quickly and that stupid Jed doesn’t even get eaten by the panther! Poss at least shows some potential to break us out of the starting blocks. He’s got eyes for Jed’s mom and threatens to take their property away if they don’t let him move in and take mom for his own wife! Now, we know all that’s the ultimate insult to these southern hill people and Jed can’t let that sort of thing slide. Nobody is going to go cornholing his mom but his daddy and him! It’s part of the code of the South! Jed manages to run Poss out for the time being, but wouldn’t you know it, there’s another crisis for Jed to deal with! And that’s the Yank soldier they’ve got hidden in their house! Jed is ready to turn him over to Poss and doesn’t give a crud what happens to him. His ma though is well versed in the concept of karma and says they need to treat the guy with dignity because her old man might be in some Yank prison and she hopes they show him the same kindness. I have to agree to with Jed’s mom since the Yanks were the good guys and the Southerners were the bad guys. And also because the wounded Yank was played by Richard Anderson who was Oscar Goldman from The Six Million Dollar Man! I loved that show as kid! God, I wish the menace on this mountain was Bionic Bigfoot! As the Civil War concludes, Poss turns into a Confederate deserter who teams up with other deserters to become a rampaging force of bushwhackers that terrorize the area! Poss returns to Jed’s home and takes over since it sits on a mountain and makes for a hideout that can be defended easily. The rest of the movie involves Pa and Jed working to eject Poss and his crew from their land. Jed does his part by getting caught trying to steal some Union rifles from a Yank camp. As luck would have it though, the camp is run by the Yank that his family helped earlier in the movie! And now the Yanks are going to return the favor! By shooting a piece of field artillery at their house in an effort to get Poss to surrender! It gets fired about three times before Poss pusses out. Director Vincent McEveety proves that the stink of Superdad and Smoke was no fluke with this Civil Bore. Poss is the only character who has any life to him. Everyone else is a wimpy whiner you just wish that General Sherman would march on through and torch. Why was I supposed to care if some white trash hilljack got run off their land by some other white trash hilljack? The most interesting thing in the movie was that the guy who played Poss (Albert Salmi) died under mysterious circumstances with his wife in 1990. Menace On The Mountain also marked one of Jodie Foster’s earliest roles, playing Jed’s creepy blonde little sister. It must have really sucked if you waited all week for Disneyland on TV and this thing came on and you knew you had another week of it to go after part 1 was finished!